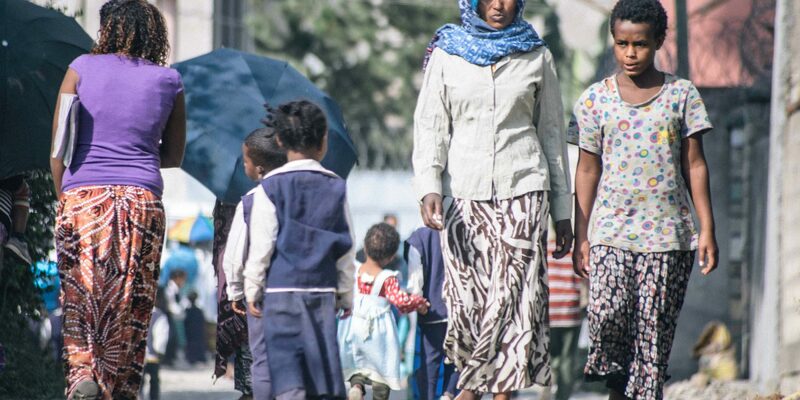 Marta escaped to Ethiopia from a neighboring country with her 2 children in May 2014. Since she was 9 months pregnant when she fled, she ended up giving birth to her 3rd child while enroute. Fleeing refugees find a very perilous journey, but her travel became extra complicated because of her new born baby and a lack of food. Finally she arrived in Addis Ababa and came to Kore’. But, she faced a new challenge – she had no place to stay and started to live outside of someone’s home, homeless for over 3 months. They did not have anything except the clothes that they were wearing. They were relying on alms from individuals in order to eat. One day a neighborhood woman appealed to Embracing Hope to intervene for this family. After they became a beneficiary, EHE took major actions to address the immediate needs of the family. Staff assisted Marta with finding a house to rent and then paid her rent until she could find work and start paying it herself. The whole family was also served lunch every day at the day care center to provide them with nutrition. EHE also provided basic needs for the family such as clothing and shoes for the whole family , blankets, mattresses and other household needs. The children started at the Embracing Hope School and Day Care where they now had a safe place to grow healthy. At the same time Marta was receiving the counseling and encouragement that she needed in order to settle in to her new environment and get started in work. Over time Marta settled in and started working as a cleaner and cooker for different individuals. She is now earning enough to feed her family, pay her house rent, and to send her older child to a school. She is so excited to be living a better life now and to have her children in Day Care and School. In addition she has saved 1800 ETB in her savings account. When Marta and her family came to Embracing Hope they were in a desperate spot – displaced , homeless, despairing and hungry. She had no hope of anything ever improving. Marta has said that if she was not able to get EHE’s support at that time, she believes that her newborn Child would have died. Thank you for your partnership which has allowed Marta and her children to experience life today and to have hope for tomorrow. A Dad in despair, considering suicide…who today is thriving and full of life and hope for his family. Girma* and his family enrolled in Embracing Hope’s programs about 3 years ago. They came during a season when new families were being added because he was unable to work due to illness related to him being HIV positive. At that time he was having massive respiratory issues and suffering from joint pain that prevented him from working. Economically, the family was living on a small amount of income that Kidus* Mom was able to make washing clothing. At that point, Kidus’ Mom was making 450 ETB month (less than $20) which could not even feed one of their family members, let alone pay rent and other household needs. Girma was staying at home to watch after Kidus. Medical follow up and treatment was unthinkable for Girma even though he knew he was HIV positive. His health was deteriorating and without intervention Kidus would soon lose his father. EHE Staff intervened and started providing Girma with medical treatment and supplementary food support which helped him to recover and get physical strength. The Family also was provided with other supports such as; clothing, mattress, blankets, sheets, pillows, and hygiene materials. As Girma regained his health, he started working as a daily laborer and also as a part time guard. Within little time he was earning 1,000 ETB per month in addition to his wife’s income. Once Kidus was registered in the project, he stayed in the day care center every day. With the provision of nutrition 4 times per day, early childhood support and social relations in a loving and caring environment, he started to thrive, too. Today Kidus is in the Embracing Hope School and he continues to receive all the supports EHE provides. Today, Girma has saved 5,000 ETB in the bank and is providing food and housing for his family. His health is good and he loves to work. He also has hope of a better life because of EHE’s support- counseling, prayer, and supplementary food support. He told our staff that he had lost hope when he was told he was HIV positive, and thought about committing suicide by throwing himself off of a cliff or into the river. But now he is full of hope. He has learned to read and write through EHE’s Adult education and he leads a happy life with his wife and children. He also has a plan to one day have his own house, and help his children to continue their education. All it took was a very simple intervention to help a Dad in despair to embrace hope in all areas of life. Thank you for investing in life changes that God gives us the privilege of partnering in. Yehsi* and her husband were a loving family that were just getting by. But, like so many families that Embracing Hope serves, a crisis changed the entire landscape of their family. Along the way Yeshi became very sick and needed to be hospitalized. This is when it was discovered that both she and her husband were HIV positive. Shortly after her discharge, AIDS claimed her husband’s life and life for her family became much more difficult. Fortunately there were people around Yeshi who helped to counsel and support her, as well as made sure that she was receiving medical treatment. Slowly, she became healthy enough to start back to work as a daily laborer. One day Yeshi met a co-worker who was also HIV positive. Within a short amount of time they got married. This is when Yeshi got pregnant with her second child Hana. When Hana was just 7 months old, Yeshi’s new husband abandoned the family and left her unable to feed and support her children. This is when Embracing Hope staff intervened for Yeshi’s family. At that time they were in despair and malnourished. Yeshi was trying to wash clothing to feed her family, but was not making it. There also was a cloud hanging over the family as conflicting HIV results had been reported about Hana and it was believed that she might be HIV positive, too. Hana was accepted into our Day Care where she had a safe, caring and loving place to learn. She received daily nutrition as well as Early Childhood Education and healthcare. Yeshi received the freedom to go to work in addition to health care, basic need provision, house rent assistance, ongoing HIV counseling and spiritual counseling. She also started receiving a special monthly stipend from Embracing Hope to buy eggs, milk and meat to help her to stay healthy while fighting HIV. Today, life is much different for this family. Yeshi is working and is able to provide food for her family as well as pay their house rent. Hana is in the Embracing Hope School and is thriving there. After a number of tests, it also was determined that Hana is HIV Negative, which is a huge reason for celebration for everyone!! Yeshi also has been able to save some money and has almost 5,000 ETB now saved in a savings account. This has given her great hope for the future. And best of all, this family also has chosen to follow Jesus. They are born again, love God, and attend church. Yeshi stated that if they had not received support from EHE she would not have been able to survive and her children would likely be orphans and hopeless. Thank you on behalf of this family for your great and unconditional support to save their lives. Your support helped to restore the dignity and hope of Yeshi and her children.